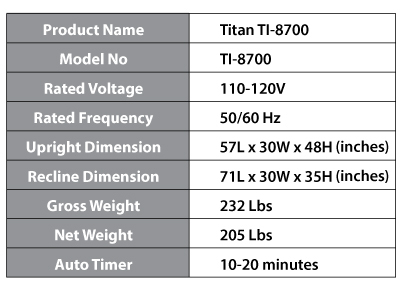 Titan TI-8700 is latest in Titan Chair Technology, now integrated with foot rollers and outer shoulder massage. Areas of shoulder, arm, hip, and calf have designed with effectively functioning air bags to enhance the relaxing massage experience. The remote is the latest in design from Titan to provide an easy to use experience with the bulkiness of past remotes. The compact remote with easy to view LCD screen is packed with features. When you open the flip down cover, various massage modes, strength, speed, width and the area to apply massage are quickly accessible. You can also independently select the area of airbag massage. The manual mode of massage includes kneading, tapping, shiatsu, and rolling. There are 5 preset programs to select from; Morning Wakeup, Sporting Recovery, Full Body Relax, Neck / Shoulder Therapy , Lower Body Therapy and Strength.. The intensity of the air massage that activate with the preset programs can be controlled to 5 different intensity settings.